Another Beautiful Day in Paradise. Absentees Laura, Dave A, Mike M and Wendy came. Welcome all. The day started off nice and cool but a little foggy. However by the time we were ready to hit the trail it had cleared up into a beautiful day. Roy had already checked out the road to Honeymoon Island and reported there was a lot of sand on that trail. Coming from the North was a long steady stream of runners. We decided to head North anyway and just be careful of the runners. 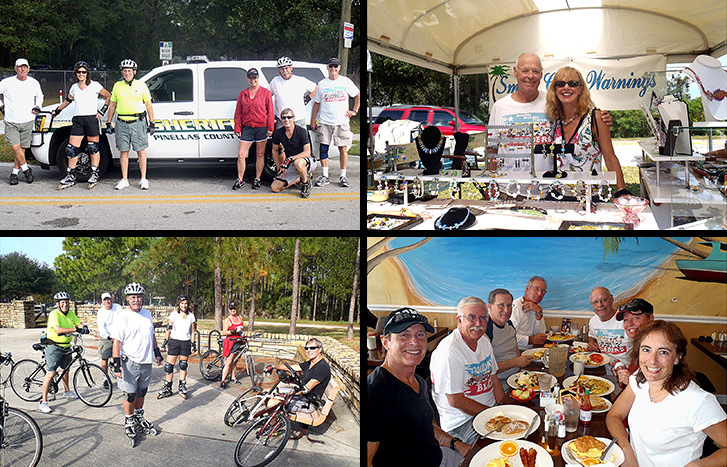 We got up to Wall Springs, took a break, rested and decided we should head to the Old Train Station in Tarpon. Our round trip skate which all did was 15 miles and was good practice for our upcoming Pinellas Trail Skate. Roy had an early start and logged 20 miles. We Brunched at Benedict's as planned. Roy got over first and reserved us a table which was perfect timing as Benedict's started getting busy. The coffee flowed freely and the service was good. It had been a while since we had been to Benedict's and had forgotten how good and plentiful the food was. Most of the ratings were 9.5 and we had one 10. We'll give Benedict's a 9.6. After Benedict's several of us headed over to the the Art Show off Michigan Blvd.